Nandita Wood Spice incense sticks are made from the traditional recipe blend that is enjoyed all around the world. Made in India using only the best ingredients of essential oils, resins, exotic flowers and a unique blend of rare herbs, wood spice incense will fill your home and environment with this beautiful fragrance of wood spice giving you a calming and relaxing home and environment. An ideal and popular fragrance for meditative and spiritual use. 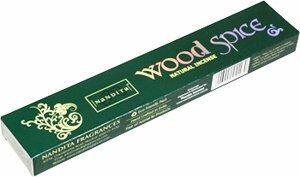 The ingredients used in the Nandita woodspice incense sticks are organic, natural, non-toxic, ozone friendly and alcohol free, making these Indian incense sticks truly safe to use, natural and pure. How to use wood spice incense sticks: Simply light the woodspice incense until it glows and then blow it out, place the incense stick into a incense holder to enjoy the wonderful aroma of wood spice. Each stick is hand rolled using the finest natural ingredients. Each incense stick is 8 inches long, with a burn time of about 40-60 mins depending on the room conditions. Each 15g pack contains about 12 incense sticks.